A peculiar WWII relic. 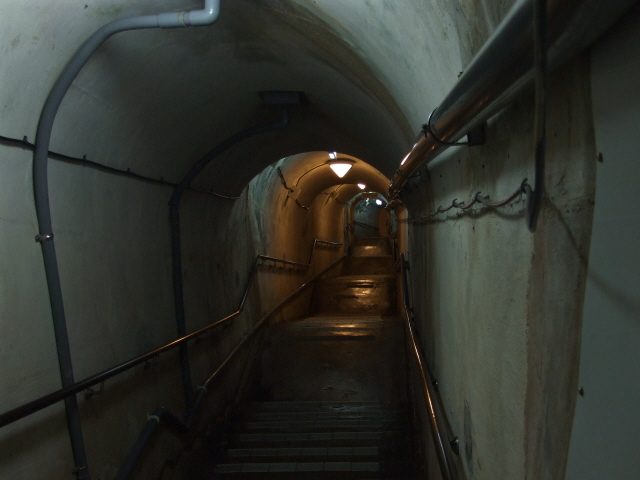 The Japanese Navy used this underground tunnel system as their headquarters during the Battle of Okinawa. From here commanding officer Rear Admiral Ota sent a lengthy telegram message to Tokyo on 6 June 1945, i.e. 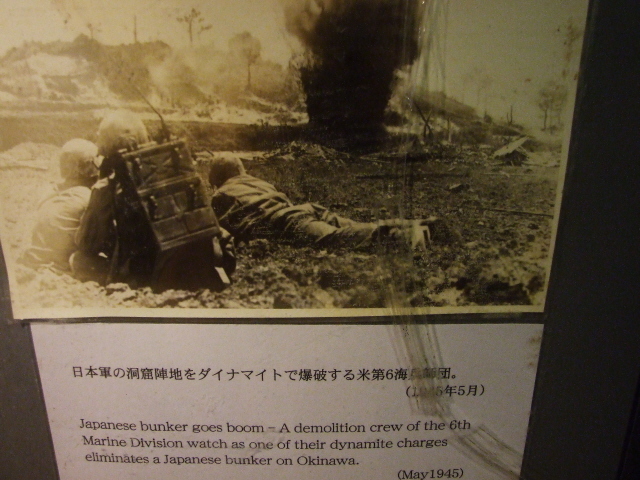 when the battle was as good as lost, in which he commended the bravery and fierce resistance that Okinawans had shown in the long battle (… the picture comes out rather differently at the Himeyuri Peace Museum!). A few days later he and his other officers "died an honourable death", i.e. committed suicide in the tunnels. 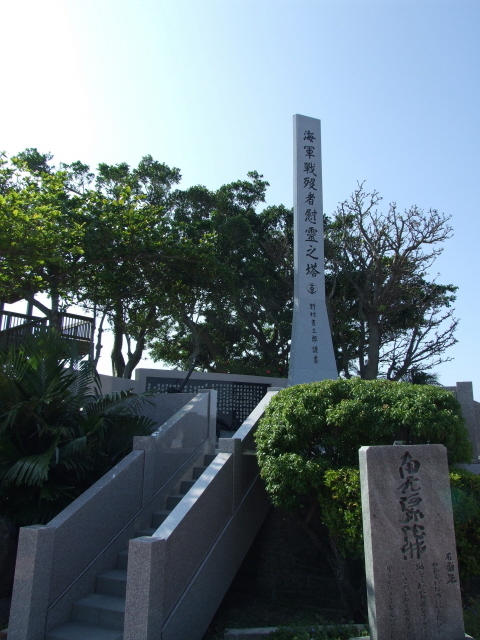 What there is to see: On top of the hill in which the tunnels are located, stands a monument to Admiral Ota and other Navy personnel (it's of a rather bland design), and next to it is the main entrance to the site. 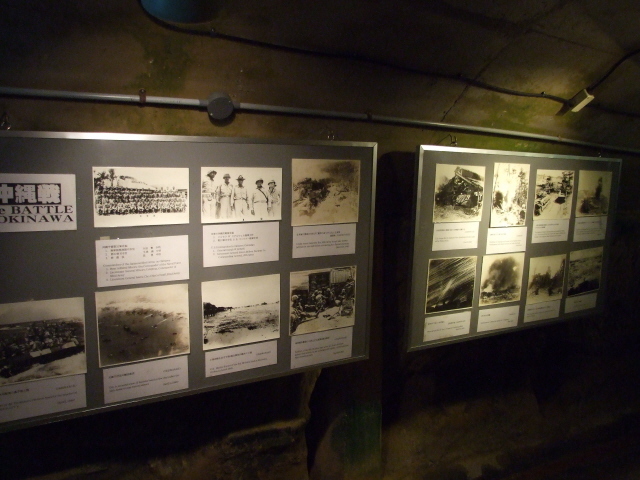 Before descending into the tunnels, you can view a small single-room museum. 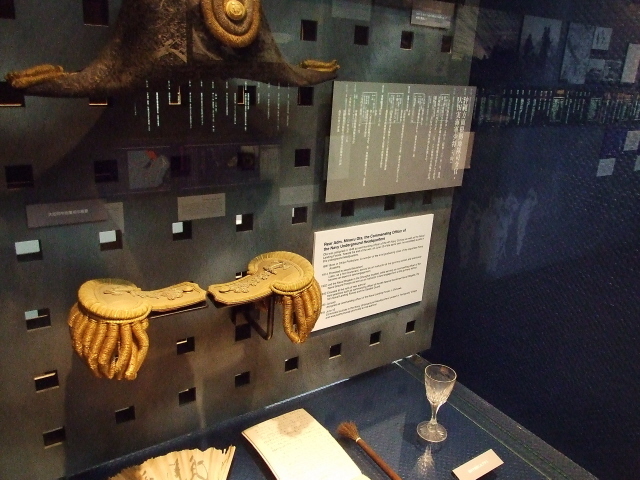 In it the story of the Battle of Okinawa is recounted very briefly and artefacts such as old uniforms and rusty weapons used in the battle are on display. English translations of accompanying texts are generally OK here – unlike in some cases in the actual tunnels. 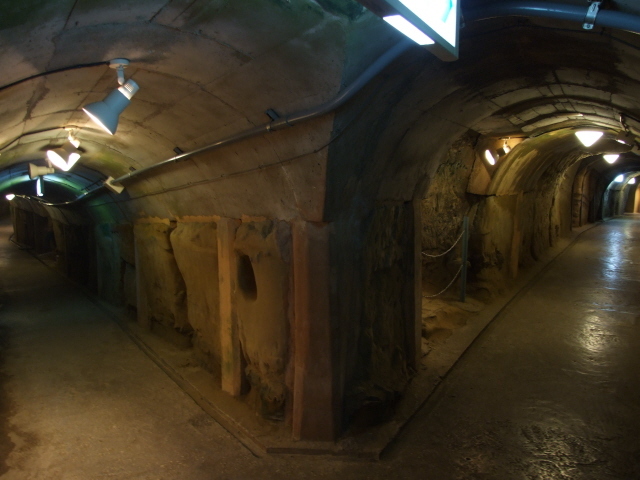 The heart of the site is obviously the tunnels themselves, which have been largely preserved in their original state (or so the museum claims). About two-thirds of the whole system is open for tourists and a circuit through a series of rooms and tunnels is signposted. 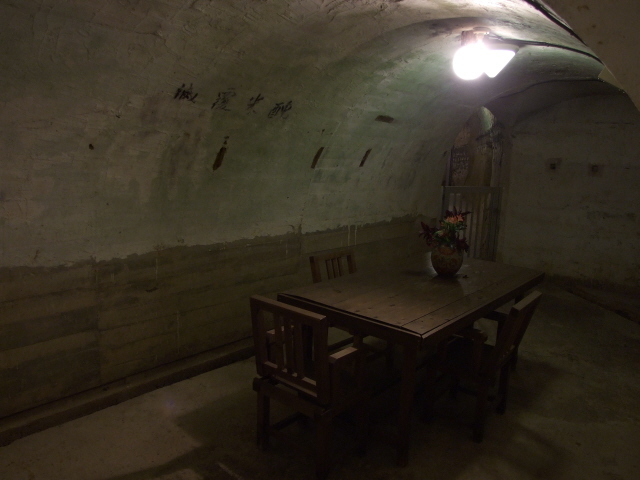 The rooms are mostly bare, except for the former commanding officer's room in which there is a table with a vase in the middle and chairs around it. 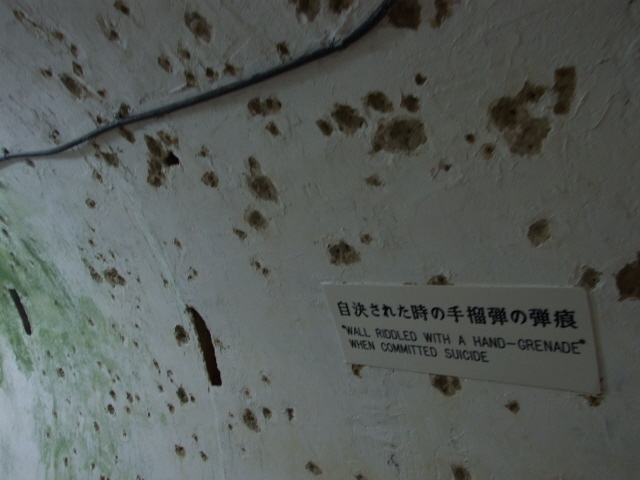 More exciting, and just a little on the dodgy side, is a room with pockmarked walls described by a sign as "wall riddled with a hand grenade when committed suicide". 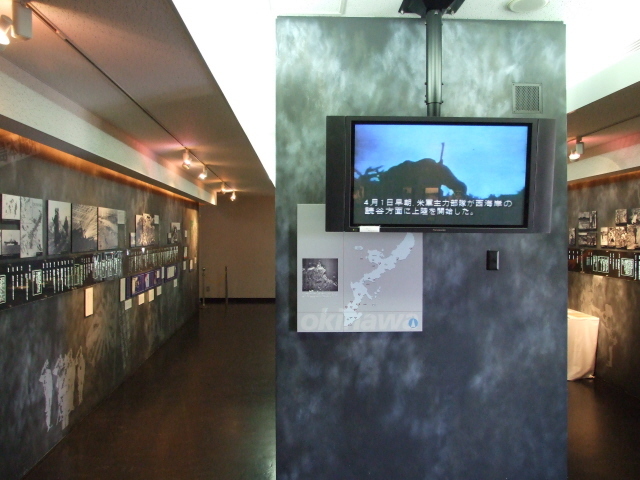 There are also a few text and photo panels providing a little more information (also in English, but also not exactly always word-perfect …), but overall, the focus is more on atmosphere, less on information ... and and what there is is nowhere near as comprehensive and thorough as at the Okinawa Peace Memorial Museum. Location: on (and inside) a hill just south of Okinawa's capital city Naha, in Tomigusuku, off the route 7 bypass. Access and costs: not too difficult to reach, nor pricey. Details: to get to the site from Naha terminal take bus No. 33, 46 or 101 (every 20 mins.) and get out at Tomigusuku Koen Mae (after a ca. 25 mins. ride) – from there it's a 10-minute walk to the Navy Underground Headquarters Park. By car: leave Naha to the south (route 58, becomes 331), cross Meiji bridge, turn left just beyond the park (onto route 7), then keep right to go onto bypass 7 and just past the tunnel turn left, immediately left again – and then right up the hill to the car park(s); there are signs to help you find it. Or get a taxi. The fare from Naha should be about the same as to the airport. The former Navy underground HQ is also the first stop on the tourist half-day bus tours of southern Okinawa. The monument and the small museum at the top of the hill can be visited for free, admission to the underground tunnels costs 420 Yen (normal adult price, children half price, there are also group reductions). Opening times: daily, year-round, from 8:30 a.m. to 5 p.m.
Time required: This is the one stop (its first) on the general south Okinawa tourist round trips offered from Naha at which visitors are actually given sufficient time (in contrast to the stops at Himeyuri and the Peace Memorial Park, which are way too short, esp. in the case of the latter): 40 mins. In fact, that's generous. I spent only half an hour here at best when I visited (independently) in April 2009 ... but it was at the end of a long day and maybe I was beginning to feel the onset of some symptoms of "battle-museum fatigue". Combinations with other dark destinations: see Okinawa.